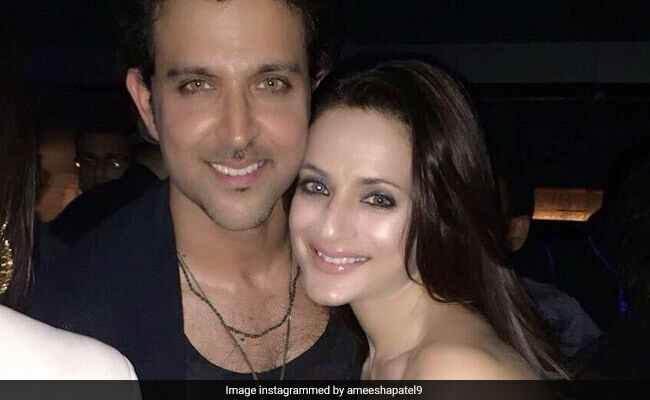 "Happy birthday to my darling Hrithik Roshan... have a fabulous year," reads Ameesha Patel's post for the actor, who turned 44 on Wednesday. Ameesha made two separate posts for the actor, saying Hrithik will always be "special". "Happy b'day golden boy Hrithik Roshan... ours was the first beginning and will always be special," she wrote in a fresh post along with a photo, which appears to be a throwback memory. It was in 2000 when Ameesha Patel and Hrithik Roshan had fabulous starts to their careers with Rakesh Roshan-directed Kaho Naa... Pyaar Hai being the debut film for both the actors. Happy bday golden boy @hrithikroshan .. ours was the first beginning and will always be special. While it was a very promising start for Ameesha, she could barely manage to maintain the graph at the box office and had only a handful of hit releases - Gadar: Ek Prem Katha and Humraaz. But she has always looked forward to a sequel of her maiden Bollywood film with Ameesha and her first co-star reprising their roles. Sometime in 2016, when Hrithik Roshan launched Pooja Hegde in his period piece Mohenjo Daro, Ameesha told IANS: "Of course I want a sequel to Kaho Naa... Pyaar Hai. But more than me people want Hrithik and me to come together for a film. My social media pages are flooded with messages for Hrithik, Rakesh Roshan and Filmkraft Productions, like 'Please make Kaho Naa... Pyaar Hai'." Well, it appeared Ameesha said this because she wanted to make a point about the Mohenjo Daro actress' debut: "Even now, for the promotions of Mohenjo Daro, Pooja Hegde's Dubsmashed a song from my film and Hrithik too sort of promoted Kaho Naa... Pyaar Hai. I'm sorry that Mohenjo Daro didn't do well, and the plan was to come with a newcomer, but every film cannot achieve the same success as Kaho Naa... Pyaar Hai." On the work front, Hrithik Roshan is looking forward to Yash Raj Film's next action drama, also starring Tiger Shroff and Vaani Kapoor.